David Chiarelli - Latest Edition! 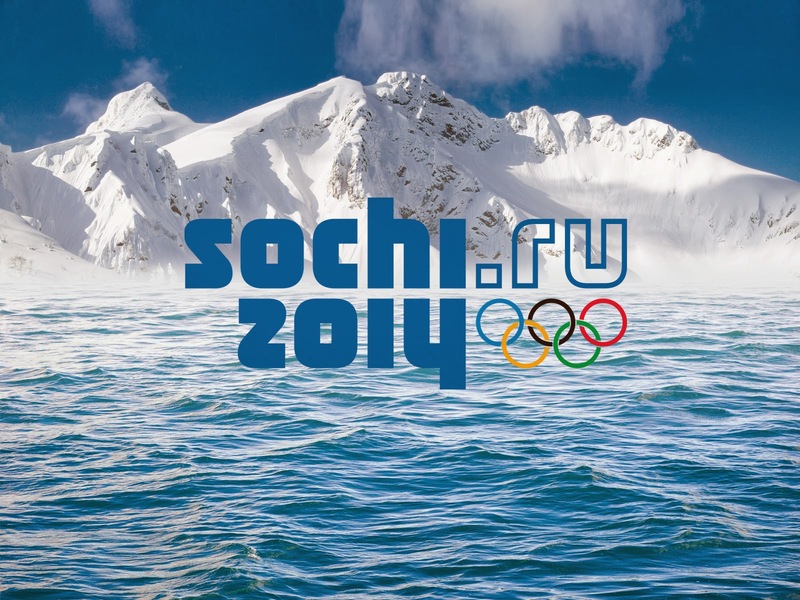 : Canada: Sochi 2014 Winter Olympics! 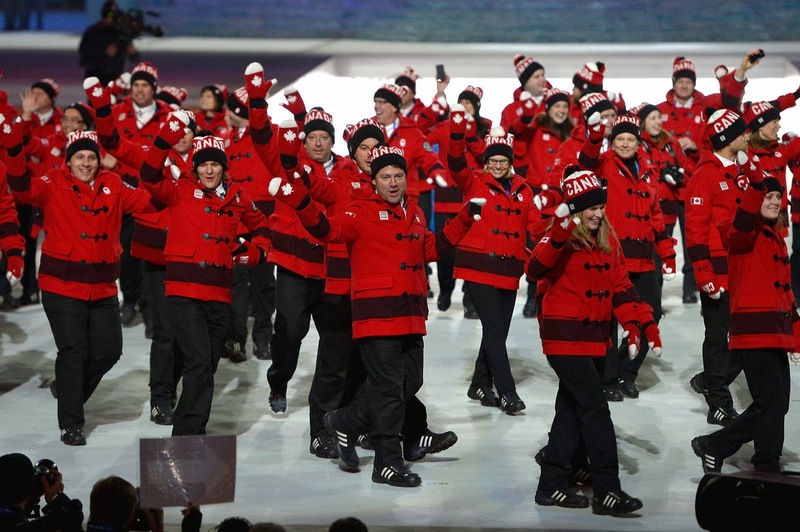 Here's a page of links to Canada's top moments at the Sochi 2014 Winter Olympics @ Best of Canada! 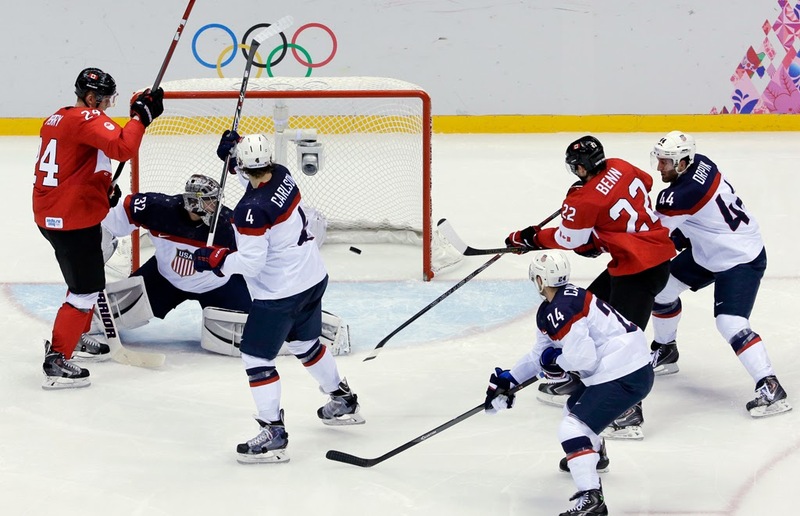 Read about, watch or listen to the Canada Olympic news round the clock online @ Tsn.ca Live Feed! You can follow the Canadian medal count, latest breaking news + info on our athletes via the Official Canadian Olympic Website @ We own the Podium! 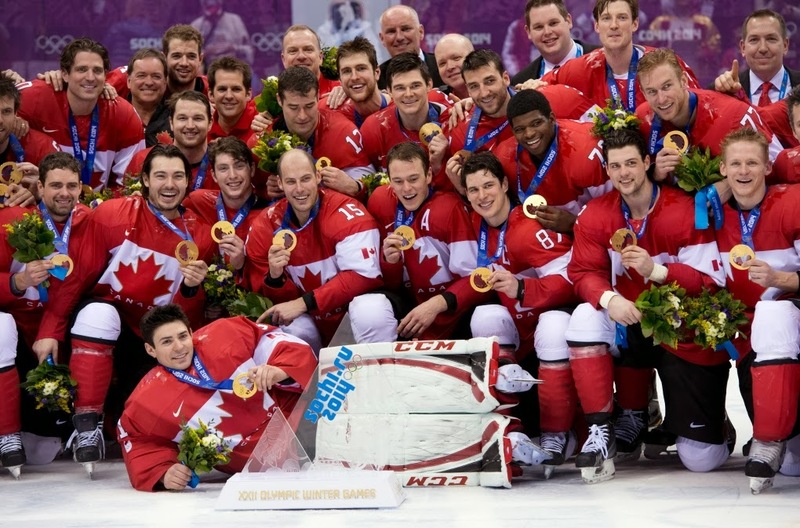 Canada Men's Hockey Gold on Feb 23 in a 3-0 shut out against Sweden! Canadian Men's team beat US in Friday hockey semi final Friday Feb 2! Details @ Hockey! 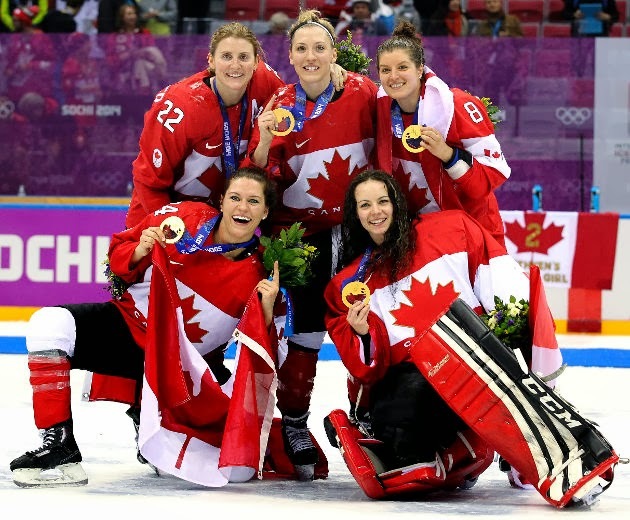 Canadian Women's hockey team wins Gold for 4th time in a row on Feb 20! 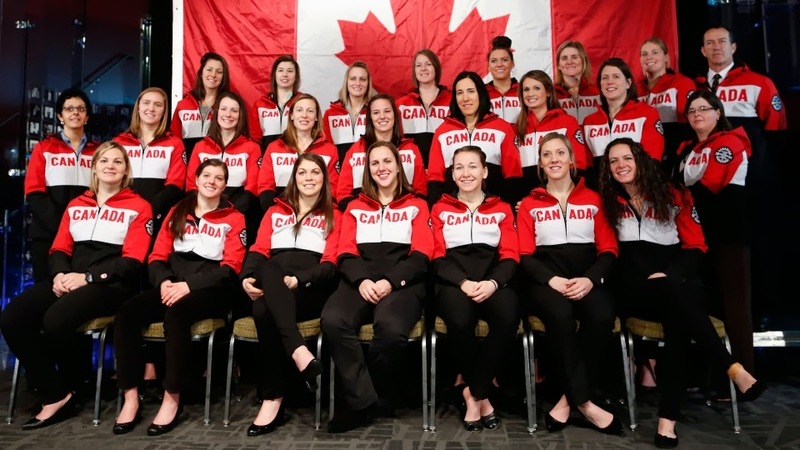 Canada Women's hockey team above! 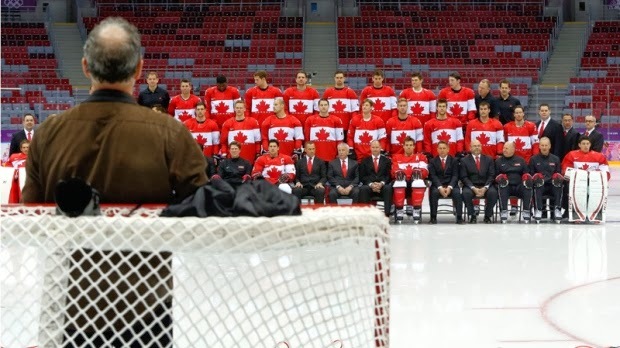 Excitement as Team Canada men's hockey team moves into the semi finals Feb 19! 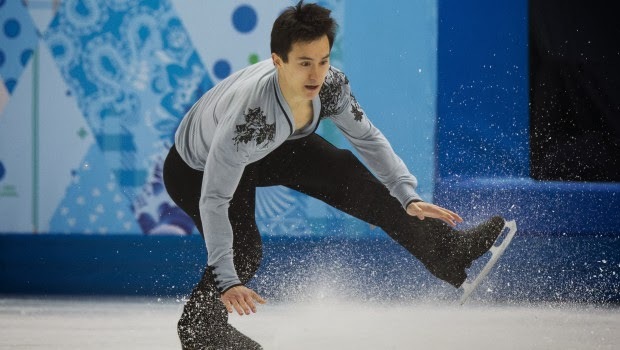 Canadians take silver in Ice dancing Feb 17. 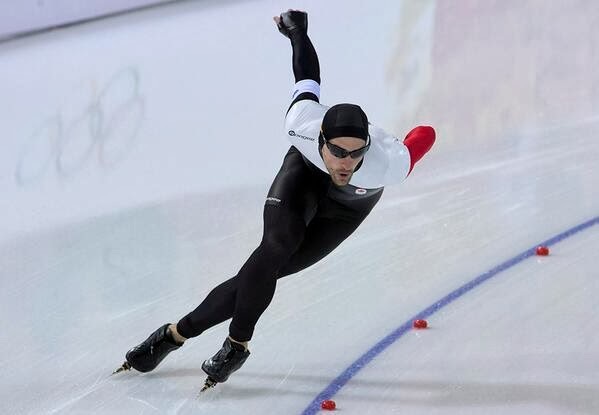 Canadian silver in Men's 1000 Metre Speed Skating Feb 12! 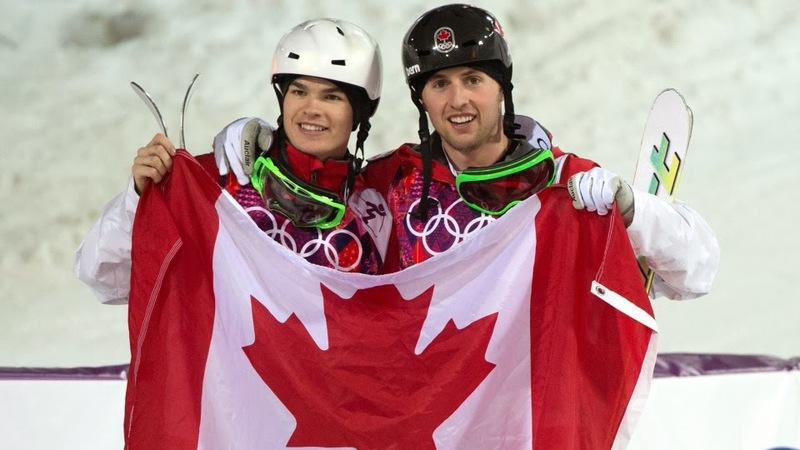 Canada takes Gold + Silver in Men's Mogul Mon Feb 10 at Sochi! Although it's only lunch time Friday Feb 7 here in Toronto Canada, the 2014 Russian Winter Olympic opening ceremonies have all ready commenced due to the time change. They are recreating the history of Russia. 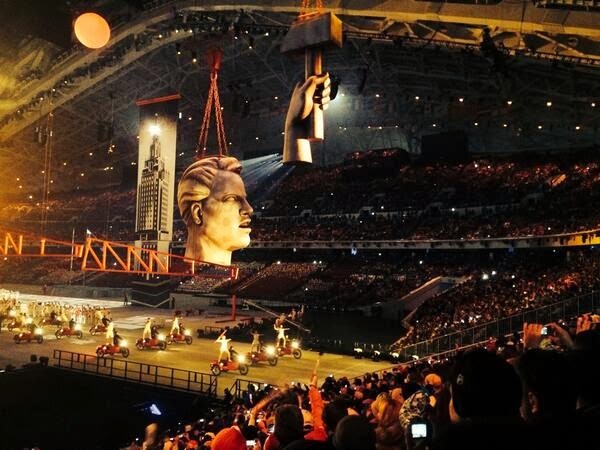 I look forward to seeing how they represent the 20th century: Lenin, Stalin, WW2, the Cold War, + the Soviet Collapse! 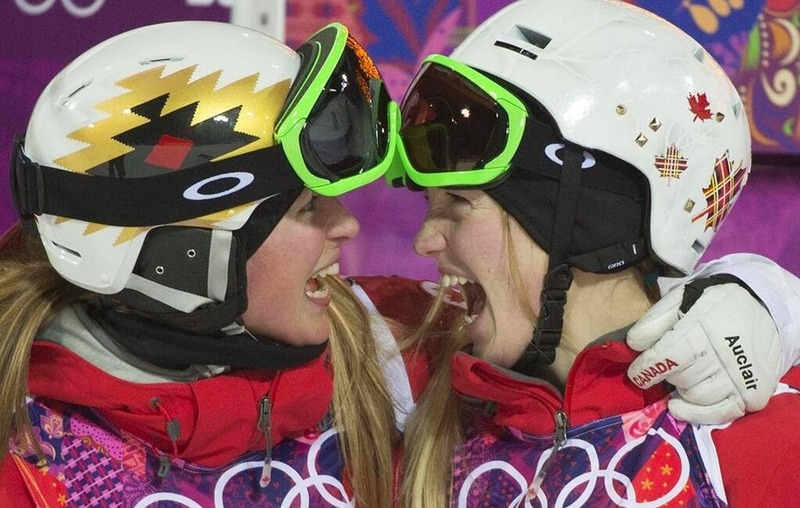 Canada takes Gold + Silver in Women's Mogul Saturday Feb 8! Retirement is great. I am sitting on my couch, still in my pyjamas with a coffee while it's freezing f'ing cold outside. Ha. Maybe I'll go out for dinner tonight. Dunno. I had planned to watch the opening ceremonies this evening but it's on now. Wonder what the networks will do for this evening for everybody else when they get home from work? Maybe you can set up a t.v. in the staff room? Canuck team officially arrives at Sochi! Right now they are performing an interpretive dance of War + Peace. Hmmm. That was kind of a long book wasn't it?!? The could cut this as far as I'm concerned, but it is quite the spectacle. What I saw: The Russian Revolution: a dance of people + machines. Floating abstract shapes. Better than it sounds .... a very short clip @ Abstract Communism? Skips to WW2. A bomber sound. Now lots of rebuilding: a big construction worker thingie. Young Pioneers. Everybody dressed the same...... oooh! Cosmonauts marching with a big rocket. I like! 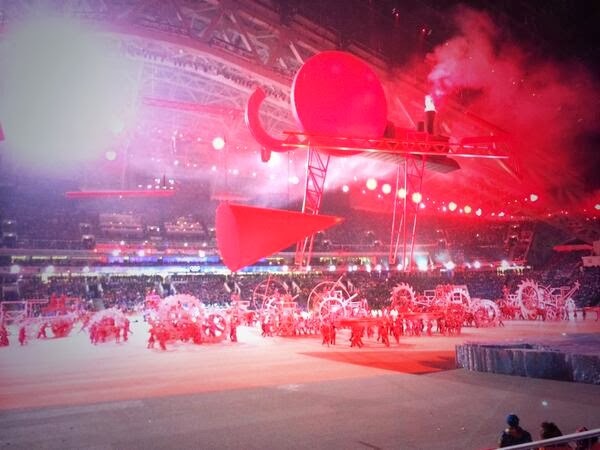 A red square parade: An abstract hammer + sickle floats by. Folks are dancing to rock + roll while policemen try to wave them away. Red Army chorus singing Moscow bights. Armies of women with baby carriages. Lots of fast construction and everybody running everywhere. They spread out to form two huge circles as the floor clears. A little girl floats away holding a balloon. Historical revisionism is always very dicey at best but I'd give this a solid A+ for presentation + symbolism. Yup. Sochi.ru online broadcasts also here! 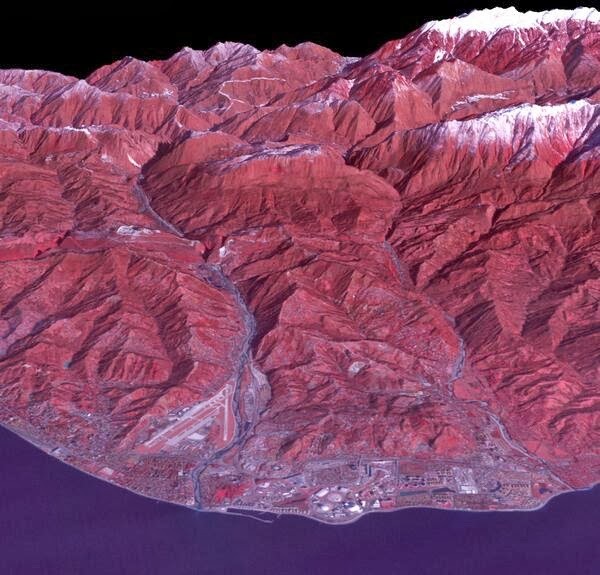 NASA photo: Sochi from earth orbit! Tres kool eh? OMG?! Some Russian attitudes might shock us, but let's look more carefully ... A sexist ad? If we say she is gay would that make it ok here? 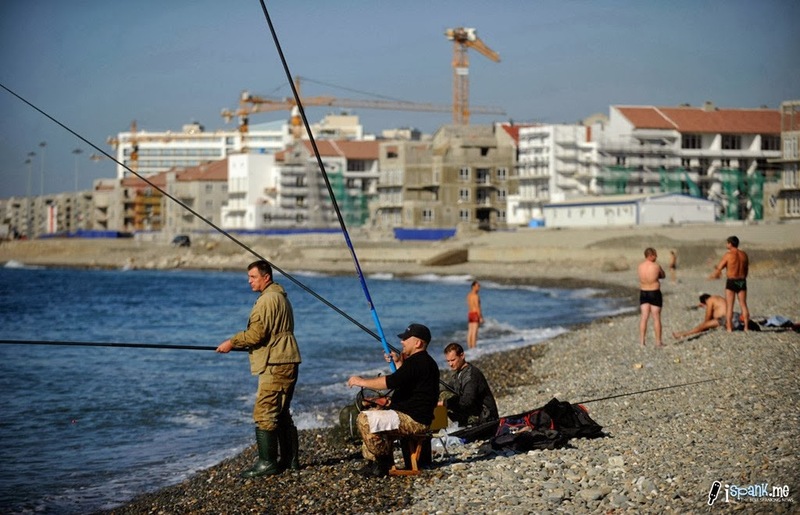 There has been lots of criticism of the Sochi Olympic preparations. It even continued right through the opening ceremony today when one display didn't light up correctly. OK folks. Fair is fair. 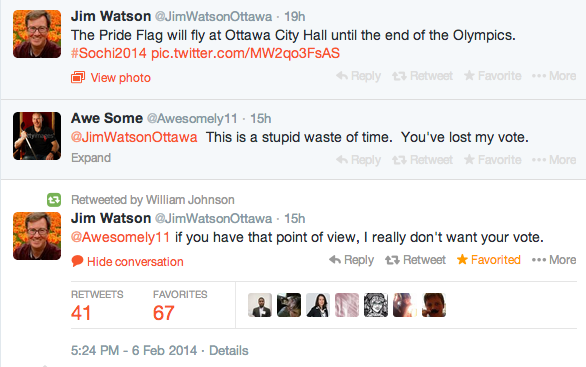 But just wait until the Pan American Games come to Toronto next year! Brace yourself! Have you actually seen many preparations under way? Ohhh! By the way, what about transportation?! NOTHING is in place as City Hall continues to argue about subways. We can't even efficiently move around 1.5 million Toronto commuters now. How about if we add another million visitors?!? Funny bathrooms eh? But Pan American visitors won't be laughing about Toronto transit next year! There are problems in Russia. I address some relevant ones here on my blogsite. But please, let's keep it in perspective and enjoy the games. Here's a litany of Rooskie complaints, rather comical, so ha ha ha but ...... Remember! See @ We are next! Toronto prepares for Pan American games? Oh wait! 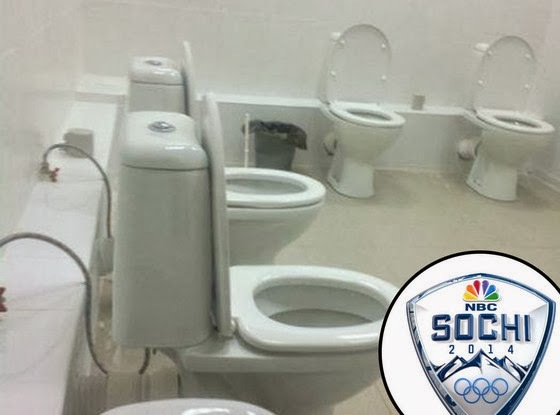 This is in Sochi?! Gay Pride flag is raised at Ottawa City Hall for duration of the Socha Winter Olympics. An interesting Twitter exchange! Russian fake lesbian duo t.A.T.u are reportedly to perform at opening ceremonies seemingly to deflect gay discrimination issue @ t.A.T.u. Jah! Even fake lesbian women in Russia must live in dump today! No care can sing! We could be in for an interesting 19 days ahead! Question: Are Unit Members allowed to attend Unit Executive meetings? In OECTA yes! I'm not sure about the other affiliates but I can't see why not. The executives are elected to represent you and carry out the business of the unit, on your behalf. 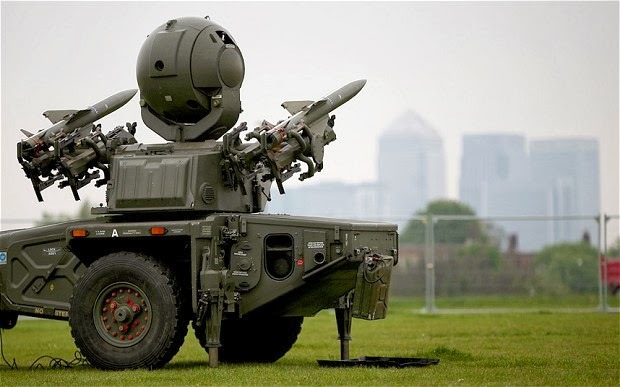 They might go into private/ in camera for sensitive information in which case you will be asked to leave until they are done. This use to be quite rare but my experience is that it has become very common, seems everything's a big secret nowadays, not good! The other difficulty you might have is that the meetings are often held during school hours in many units. This is more understandable, they are all day affairs, and a lot of very important matters have to be attended too. If you need to attend to present, question or speak I should think you could request release time, just like the executive officers get, but I am not aware of any rule on that either way. The other way might be to ask for an item to be timed for later in the day when you are free and can attend.